Jaguar’s XF is a mid-sized executive saloon, designed to take on the likes of the Audi A6, BMW 5 Series, Mercedes E-Class, Lexus GS and Volvo S90, and it has been on sale – across two generations – since 2007, when it replaced the retro-styled S-Type. The model we’re looking at here is specifically the facelifted version of the Mk1 XF, on sale from 2012-2016, with some slight overlap at the end of its run with the launch of the Mk2 in 2015. The facelift unveiled in 2011 really sharpened up the looks of the XF, making it look more like the C-XF Concept car that it was inspired by. Key to the change were much slimmer, more feline headlight clusters, which dropped the old arrangement that featured an almost-circular centre section. At the back, the lamp units were redesigned to wrap right around the central chrome trim strip on the boot, whereas the pre-facelift clusters didn’t sit underneath this brightwork. Inside, trim finishes were upgraded and extra technology, such as adaptive cruise control, was added to the roster. Perhaps the most impressive addition at the Mk1 XF’s facelift time, though, was the 2.2-litre, four-cylinder turbodiesel engine. It came in a variety of power outputs, from 163- to 200hp, and while it promised much greater frugality if you wanted to run a Jaguar, it nevertheless preserved the marque’s reputation for performance, as almost all these cars were torquey enough to run 0-100km/h in less than ten seconds. The 2.2d joined the existing 3.0-litre V6 turbodiesel engine, which was also available in a variety of power outputs – culminating in a rapid XF S Diesel, with 275hp and 600Nm. 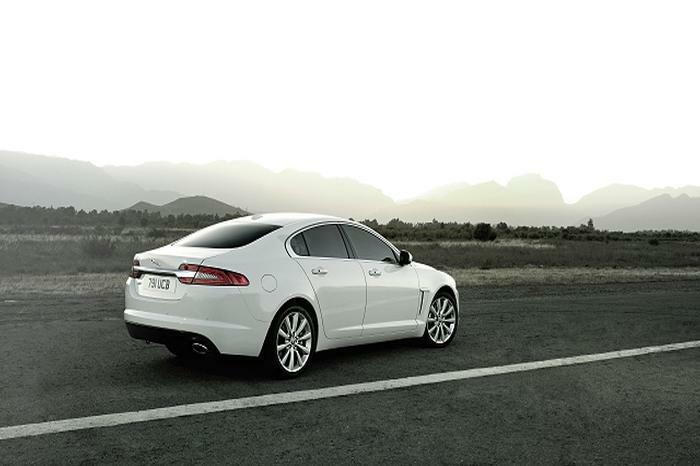 There was also an ‘S’ petrol model of the XF, which used a 340hp/450Nm supercharged V6 engine. Sitting above that was a 5.0-litre supercharged V8, which was used in the most potent, high-performance iterations of the XF – namely, the 510hp XFR and the 550hp XFR-S, the latter a limited-run special with a big rear spoiler, bespoke alloys, unusual paint colours like French Racing Blue and a big price tag. While the XF began life as a saloon, a handsome estate called the XF Sportbrake was introduced in 2012 and was available with all the engines – yes, including the XFR-S, making for a very fast family wagon. Gearboxes used on the Mk1 XF facelift range were a six-speed manual (on the low-power 2.2 diesels only) and the much-more-common eight-speed automatic. The vast majority of Mk1 XF facelift cars are rear-wheel drive, but all-wheel drive was an option on some drivetrains in right-hand-drive markets. It’s tempting to go for one of the petrol XFs, especially the thunderous V8 models, as Jaguar is known for its sportiness, but as a used proposition the XF makes the most sense with the 2.2-litre turbodiesel under its bonnet. Go for the 200hp version and you get a wonderful blend of punchy performance with impressive parsimony. For maximum practicality, team this engine to the Sportbrake wagon body. After years of trailing in the wake of the Germans, the XF was Jaguar’s first product that could stand toe-to-toe with the Teutonic elite and tempt people to go for something other than an Audi, BMW or Merc. Given the Mk1 facelift looks very, very similar to the Mk2 XF that’s still on sale today, it makes a superb used-car proposition because it continues to look like an expensive and desirable machine.